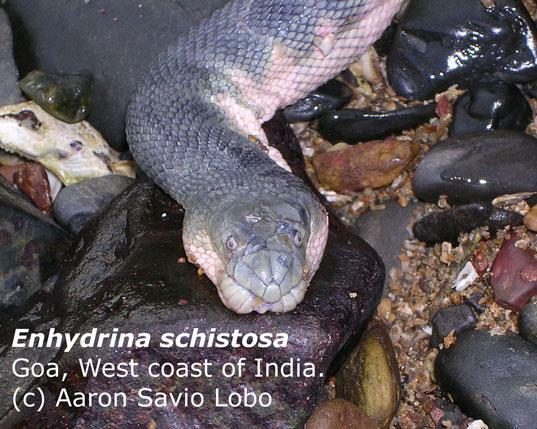 Can you confirm these amateur observations of Hydrophis schistosus? Diagnosis DIAGNOSIS: Mental scute small, partly concealed within mental groove; 3–4 maxillary teeth behind fangs; 5–6 palatine teeth, palatine teeth larger than pterygoid teeth; no subor-bital stripe; young dark gray above, whitish below, with dark gray or black annuli; pattern disappears in adults which are uniform gray in color; scales around body variable, in Bay of Bengal, scales around neck, males 43–52, females 48–55, scales around midbody, males 53–60, females 55–65, scales some-what imbricate or juxtaposed, with short central keel; ventrals 262–322; preanal scales only slightly enlarged. Total length 1400 mm, tail length 180 mm (but rarely exceeding 1100 mm total length). Diagnosis: in KHARIN 2009, REZAIE-ATAGHOLIPOUR et al. 2016: 136. Comment Venomous! 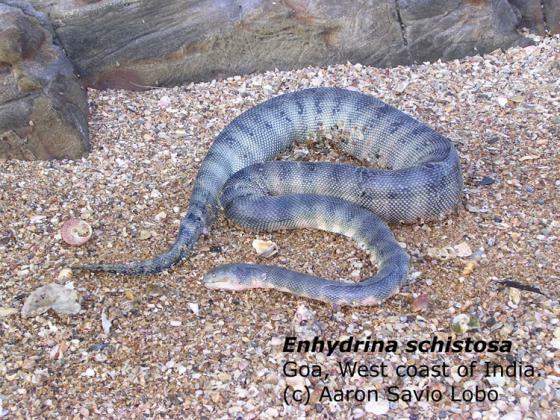 One of the most dangerous snakes with a highly potent toxin (LD50 = 0,01 mg/kg in mice; FLINDT 2002). Diversity: Australian “E. schistosa” has been elevated to species status and provisionally referred to Enhydrina zweifeli by Ukuwela et al. 2013. Synonymy mostly after STEJNEGER 1907 who listed Enhydrina valakadyn as valid species. Distribution: Probably not in Madagascar fide F. Glaw (pers. comm.). 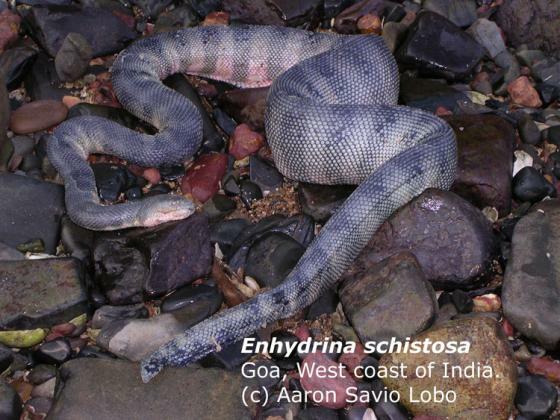 Type species: Enhydrina valakadyen Gray, 1849 is the type species of the genus Enhydrina GRAY 1849. 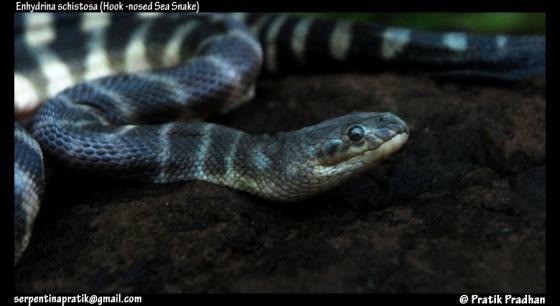 Habitat: marine and freshwater (Rasmussen et al. 2001). Bergman, R.A.M. 1955. L'anatomie de Enhydrina schistosa. Arch. Neerl. Zool. 11:127-142. Flindt, R. 2002. Biologie in Zahlen, 6. Aufl. Spektrum Akad. Verlag, Heidelberg, 296 pp.